the University of New Hampshire Institute for the Study of Earth, Oceans, and Space electronic newsletter. THE GAMMA RAY POLARIMETER EXPERIMENT, or GRAPE, has largely defined Ph.D. student Taylor Connor's graduate school experience. In various capacities, he's been working on several iterations of the Space Science Center (SSC) balloon-based project since 2006. 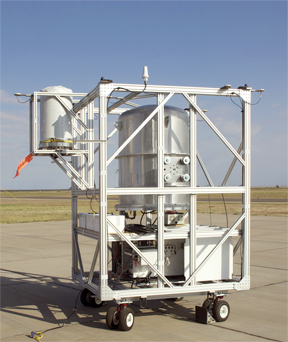 He participated in work leading up to the successful 2007 engineering test flight of GRAPE from Palestine, Texas and, after helping in the design, construction, calibration, and testing of the latest version of the experiment, Connor was out in New Mexico for GRAPE's recent 26-hour flight up to 130,000 feet where it aimed its detectors at the Crab Pulsar, the Sun, and the Cygnus X-1 black hole in search of its quarry – celestial gamma rays. 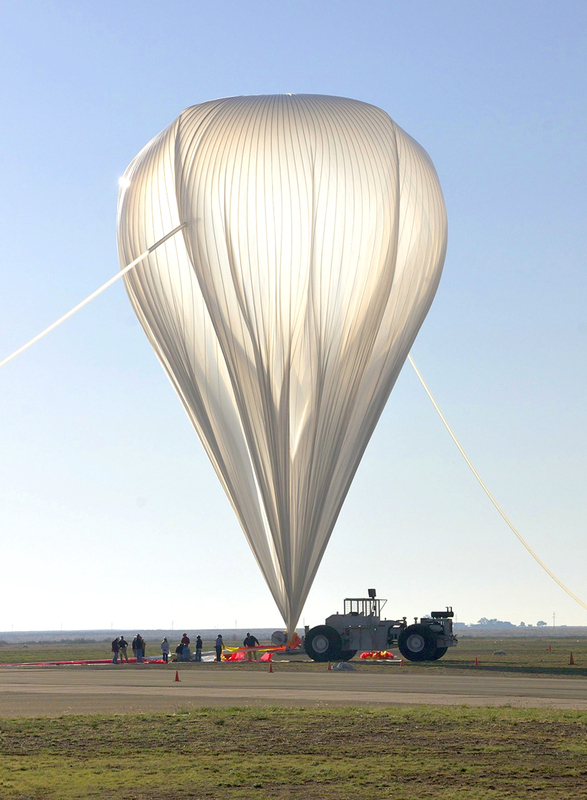 The GRAPE balloon is inflated at NASA's launch facility in Fort Sumner, New Mexico. 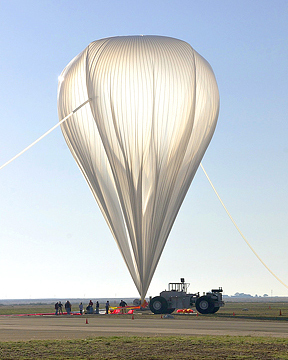 At altitude the balloon expanded to a size large enough to hold a football field. Photo by Mark McConnell, UNH-EOS. Students Taylor Connor and Camden Ertley. Photo by Mark McConnell, UNH-EOS. And, as testament to just how hands-on science-by-balloon is compared to the rigid, quality-controlled world of satellite-based space science, Connor duct taped a rabbit's foot to GRAPE's instrument payload in hopes that all the years of time and effort he and others had invested would pay off. It did. While it will take several months of number crunching to analyze the data and figure out the particulars, the initial assessment is positive. This should help pave the way for another, longer flight with a larger array of gamma-ray detectors onboard to delve fully into the experiment's ultimate goal of measuring the polarization of gamma rays from celestial sources. Polarized light vibrates in a preferred direction and the extent of that polarization can provide clues to how the radiation was generated, in essence serving as a probe of the source. Gamma rays, such as those emitted from the Crab Pulsar, are generally produced from the interactions of a highly accelerated beam of subatomic particles - massive ejections of high-energy particles that are thought to take the form of a narrow jet moving outward at nearly the speed of light. "We think that an accelerated beam of particles is the source of the high-energy radiation from the Crab Pulsar, but the structure of that beam and the mechanism by which the radiation is generated is not entirely clear," says GRAPE principal investigator Mark McConnell, a professor in the SSC and current chair of the physics department. Detecting gamma-ray polarization can provide astrophysicists with a better understanding of particle acceleration, a ubiquitous and important but poorly understood process that generates radiation and occurs throughout the universe - from Earth's magnetic field (magnetosphere) to pulsars and black holes. But it's an extremely difficult measurement to make for a host of reasons. For example, the gamma-ray signal from the Crab Pulsar is only one or two percent of the gamma-ray background noise that flood sensitive detectors. "That's part of what makes gamma-ray astronomy so challenging," McConnell says adding, "that and the fact that, like neutrons, gamma rays have no charge and thus rarely interact with material on an atomic level. Most of the time they just fly right on through undetected." But like the similarly challenging neutron detection work UNH has be doing in various capacities since the 1950s (see related story "A One-in-Ten-Thousand Chance Encounter"), McConnell notes that the more difficult the work, the more rewarding it is when it bears fruit. 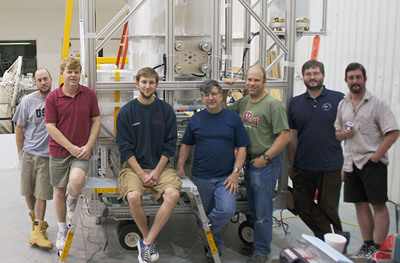 The GRAPE team at NASA's launch facility in Fort Sumner, New Mexico prior to launch. 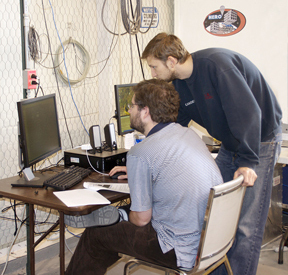 Left to right: research project engineers Jason Legere and Colin Frost, graduate student Camden Ertley, lead scientist Mark McConnell, collaborating scientist Peter Bloser, and graduate students Taylor Connor and Manuel Julien. Photo courtesyof Mark McConnell, UNH-EOS. Should a follow-up mission be funded for a potential month-long circumpolar flight over Antarctica in 2013, GRAPE would indeed be poised to bear seminal scientific fruit. "Measuring the polarization is much harder than just measuring gamma rays," McConnell says, "and it's a relatively unexplored part of astrophysics both because it's so difficult to do and because it's taken work to prove the value of the science." Notes graduate student Connor, "The measurement of polarization is not a vetted field so it's been challenging to get funding to do something that's not as tried and true as other projects in astrophysics. And," he adds with a wink, "we can't produce cool pictures and put them up on Wikipedia. But we're talking about some of the most extreme events that happen in the universe, really high-energy, highly explosive, huge events that the human mind can't really wrap its head around. That's always been the draw for me." Mind boggling as well, the students point out, is that the source of the energy from the Crab Pulsar – a star that exploded back in 1054 A.D. and could be seen in daylight – emanates from 6,500 light years away. "That's an absurd number," Connor laughs, then adds, "but in fact, that's practically next door." Cosmically speaking, that is. A few years ago astronomers spotted the most distant object yet confirmed in the universe – a gamma-ray burst that exploded 13.1 billion light years from Earth just 630 million years after the Big Bang. Fellow physics Ph.D. student Camden Ertley has been involved in GRAPE only since last spring after work on another SSC project came to a halt. The work is a natural fit since his first post-undergraduate research experience, a fellowship, was at the Argonne National Laboratory doing work in high-energy detector development. The GRAPE scientific payload inside its aluminum gondola. Photo by Mark McConnell, UNH-EOS. "The Argonne work interested me a lot, and the group here at UNH doing similar research was obviously a good choice for me," Ertley says. And while balloon-based work wasn't a particular focus of his, he notes that it has, and will, provide a richly diverse set of opportunities in the coming few years during subsequent GRAPE development and missions. "You might come in on a satellite project and the spacecraft would have been flying for years. You end up just analyzing data that's coming down, whereas with a balloon flight you're able to, conceivably, participate in everything from start to finish – from building the spacecraft to analyzing the data." Both Connor and Ertley will be analyzing the data from the recent flight – that from the Crab Pulsar and data from solar flares that occurred during the last stages of the flight, respectively. And both will likely publish papers based on results of that analysis. 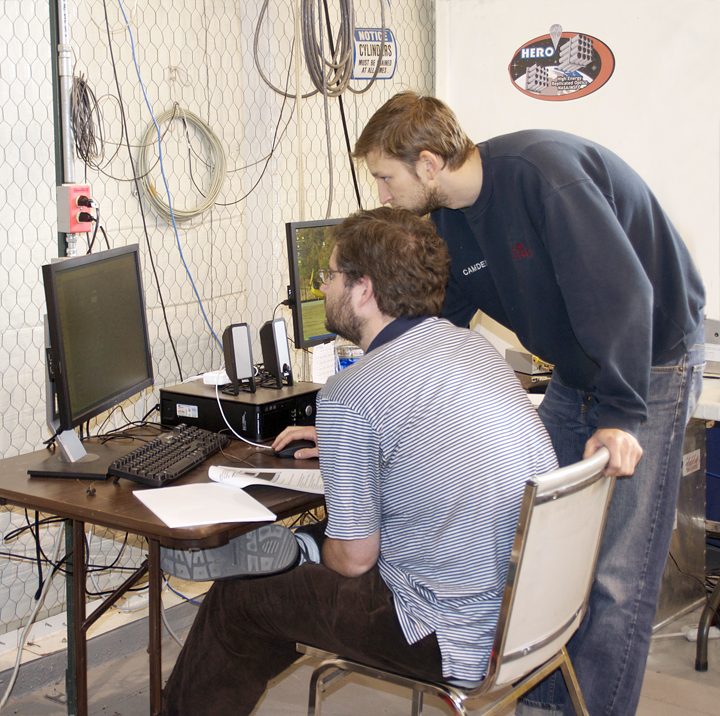 Manuel Julien, also a physics Ph.D. student, has not worked directly on the GRAPE project but used the mission to piggyback a prototype validation flight for the instrument that has defined his graduate experience – the Fast Imaging Telescope or FACTEL. Liftoff! 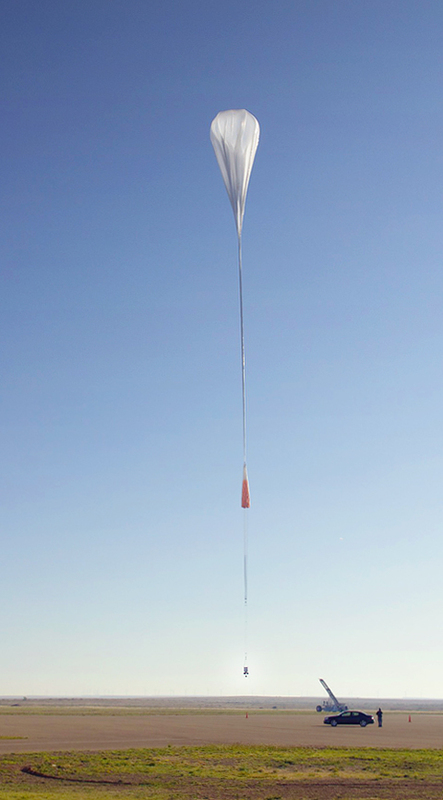 With GRAPE's payload dangling above the horizon, the NASA balloon begins its rise to 130,000 feet or near space. Photo by Mark McConnell, UNH-EOS. The telescope is based on work SSC scientists and engineers did helping to build the Imaging Compton Telescope (COMPTEL) onboard the 17-ton Compton Gamma Ray Observatory (CGRO) that was put into orbit in 1991. FACTEL represents an effort to demonstrate the latest technologies required to produce an upgraded version of COMPTEL, which should be vastly more efficient and produce much sharper imagery. The telescope's principal investigator is professor Jim Ryan. 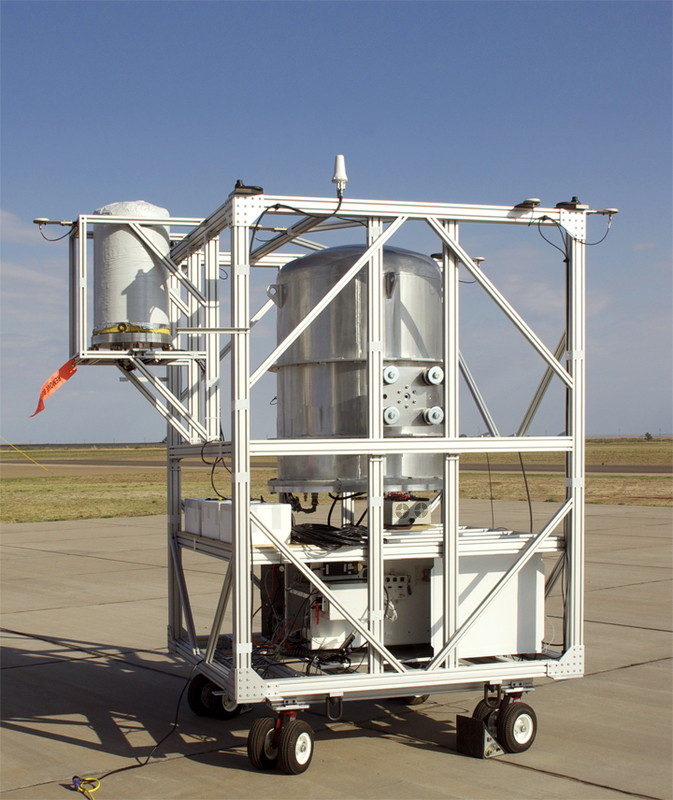 "For a next-generation instrument," Julien says, "you build a little one and hitch a ride on another balloon-based experiment to measure its initial performance." 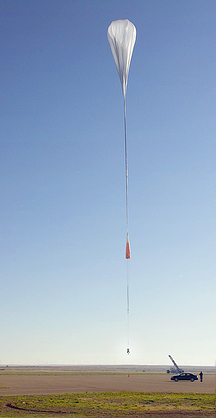 Indeed, this is precisely what was done with GRAPE back in 2007 when it was the only payload on a NASA test balloon. For Julien, who started his Ph.D. work in 2007, FACTEL has provided him with the opportunity to do everything from design, hands-on building of the instrument, software development, instrument calibration, simulation, and now data analysis. He will continue to work on the larger, second-generation prototype of FACTEL for his thesis. Says McConnell, "These students develop a diversity of skills that are widely applicable, including those in computer modeling because we do modeling of every instrument we make. In order to be good experimental scientists they really need hardware, software, and the hands-on science experience." McConnell notes that undergraduates, too, always play shorter-term roles in these balloon missions, and in fact his own son, a high school student, helped with some of the detector assembly work. "Just the exposure to the world of experimental space science, and knowing that they had a hand in something that went up to space, or near space, is invaluable." by David Sims, Science Writer, Institute for the Study of Earth, Oceans, and Space.